Our systems reduce cost and time-to-market by translating CAD Designs into an STL file for furtherance into hard copy 3D models. These models are so accurate that designers can go beyond concept modeling to produce tooling grade patterns ready for casting or mold-making. STL is a file format native to the stereolithography CAD software created by 3D Systems. STL files describe only the surface geometry of a three dimensional object without any representation of color, texture or other common CAD model attributes. This file format is supported by many other software packages; it is widely used for rapid prototyping and computer-aided manufacturing. The STL format specifies both ASCII and binary representations. Binary files are more common, since they are more compact. An STL file describes a raw unstructured triangulated surface by the unit normal and vertices (ordered by the right-hand rule) of the triangles using a three-dimensional Cartesian coordinate system. Stereo lithography and these other hard model technologies are the future of the jewelry industry. Leading jewelers effectively use CAM "service bureaus" that specialize in prototype output. Previous means of producing a prototype typically took man-hours, many tools, and skilled labor. For example, after a new street light luminaire was digitally designed, drawings were sent to skilled craftsmen where the design on paper was painstakingly followed and a three-dimensional prototype was produced in wood by utilizing an entire shop full of expensive wood working machinery and tools. This typically was not a speedy process and costs of the skilled labor were not cheap. Hence the need to develop a faster and cheaper process to produce prototypes. As an answer to this need, rapid prototyping was born. 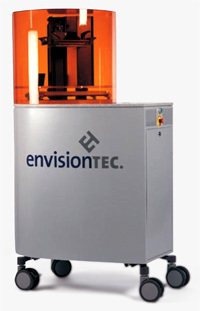 One variation of 3D printing consists of an inkjet printing system. Layers of a fine powder (plaster, corn starch, or resins) are selectively bonded by "printing" an adhesive from the inkjet print head in the shape of each cross-section as determined by a CAD file. This technology is the only one that allows for the printing of full color prototypes. It is also recognized as the fastest method. Alternately, these machines feed liquids, such as photopolymer, through an inkjet-type print head to form each layer of the model. These Photo polymer Phase machines use an ultraviolet (UV) flood lamp mounted in the print head to cure each layer as it is deposited. Finally, ultra small features may be made by the 3D micro fabrication technique of 2-photon photo polymerization. In this approach, the desired 3D object is traced out in a block of gel by a focused laser. The gel is cured to a solid only in the places where the laser was focused, due to the nonlinear nature of photo excitation, and then the remaining gel is washed away. Feature sizes of under 100 nm are easily produced, as well as complex structures such as moving and interlocked parts. With our fist-hand knowledge and experience throughout the jewelry manufacturing process from start to finish, we deliver quality stl files.